Nestled away on the mezzanine level of the famous Plaza Hotel right here in amazing NYC, you will find Assouline, home to “the most sophisticated books in the world.” And within this flagship location of one of the most beautiful bookshops in the world, is the Bespoke Bindery where you will find master binder Paul Vogel surrounded by the colorful papers, inks and ancient tools he uses to create the entirely hand-made master pieces produced right there on sight. 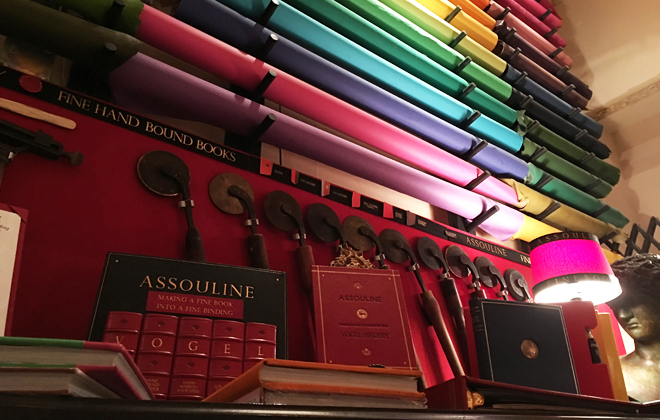 A wall of options for your personally bound book. Photo by Interior Monologue. Even the sign is chic. Photo by Interior Monologue. 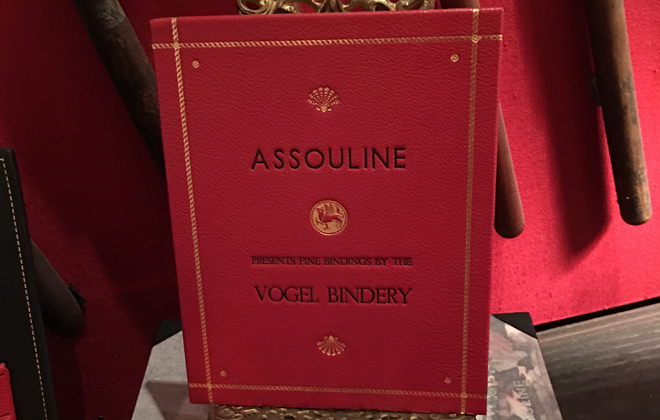 I gifted a few books from Assouline this past holiday season, so perhaps I have to up the ante next year and gift folks with bespoke hand-bound books from Assouline. 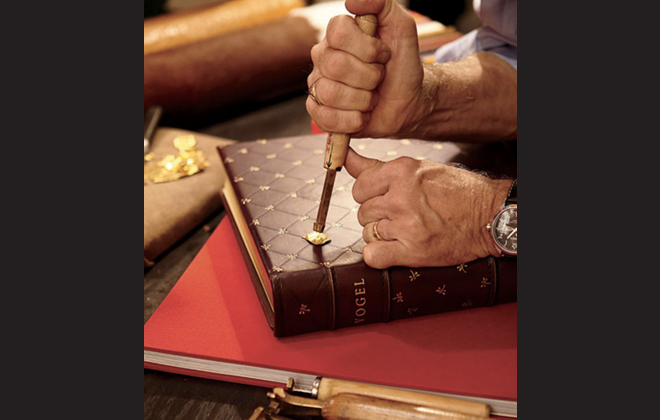 If I do, I will definitely come right to Mr. Vogle for one of his impeccable, artfully created hand-bound books. **Side note: For Christmas, I was super happy to have received a dreamy book about Valentino from Assouline which I can’t stop pouring over. Literally, I drool on the pages. I will likely now be EVEN more obsessed with the fashion house than I already am. The book is a true testimonial to the House of Valentino and is a work of art in itself. I love it! Now, back to Mr. Vogel and his book binding magic. Mr. Vogel at his Plaza hotel outpost in Assouline. Photo: Joshua McHugh for Architectural Digest. Vogel makes his mark. Photo: Joshua McHugh for Architectural Digest. 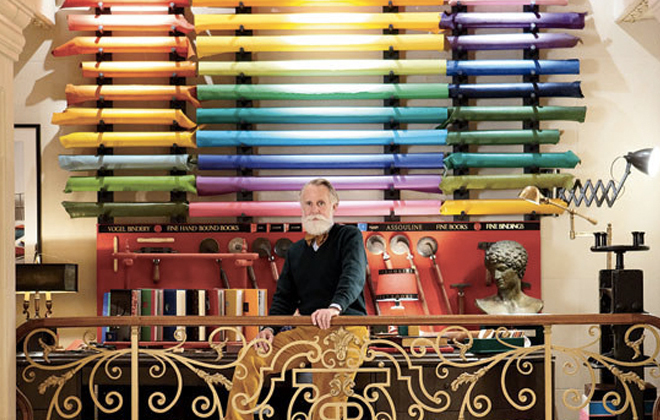 I just love the image of the regal Paul Vogle presiding beneath his wall of rainbow paper rolls, working away by hand to create any number of bespoke leather bound goods he offers—from passport covers, to boxes, to entire custom volumes for personal libraries! 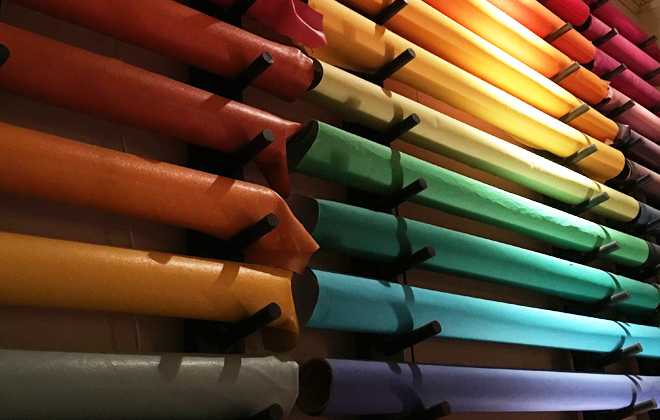 The Hamptons-based artist has been working in book binding for over 30 years, and brings a passion and devotion to his craft that is hard to find these days. I am truly hopeful as a fellow Hamptonite that I will be able to meet Mr. Vogle one day and interview him for Interior Monologue. You know I am aways on the lookout for encounters with true artisans and he is definitely one heck of an artisan!